If you still have never met ruins during travel or ocean exploration then you need to type this seed. It sends you to a small island surrounded by water where there are ancient ruins. No one knows exactly how they were formed and who is the builder, so many miners are swimming on boats in the hope of finding this hidden place. To see the underwater ruins you will need a night vision potion since the monument is under water at a shallow depth. 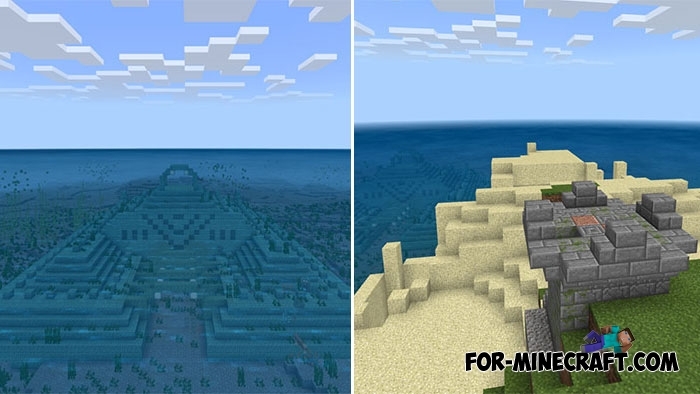 Minecraft BE 1.4 among other aquatic features has received updated water and therefore you can easily view all the ruins.